Looking for a good selection of a real-time Pokémon Go tracker? There have been a lot of them going around ever since the game was released and became popular, but only a few have continued to work even past the Generation 2 update. These scanners and trackers are pretty useful for those who want to make the most of the game, and this list will give you a good selection of apps and websites that you can rely on for maps and information. As most people already know, Niantic added more than 80 new Pokémon to the collection in Generation 2. This means that catching them all is going to be that more difficult, and you’re going to need all the help you can get to catch them before your friends do. But information isn’t enough. You’re going to need a real time scanner in order to quickly catch these Pokémon and fill out your Pokedex quickly. Otherwise, you’re going to be wasting a lot of time. But before anything else, you have to know that there are two kinds of Pokémon Go scanners and trackers. The first is the app-based kind, which are independent and very customizable. The second type are the website-based ones, which are hosted by third parties on their servers. But because these servers could be bogged down by multiple users, the first type of tracker/scanner is more reliable. With that, here are some apps and sites you can try. PokeVS – This app used to be a tracker/scanner that functions only around Santa Monica, but eventually it became popular and the developers decided to make it functional all over the world. There are a lot of users who rely on this app because it has a nifty filtration system where the list could be narrowed down to the Pokémon people want to catch. These monsters could then be marked and saved on the list for later. The system also hides Pokémon that have an IV less than a given number, such as 90% or 75%, which is pretty useful for those who are looking for better quality catches. PokeHuntr – Niantic initially caused PokeHuntr to close down due to copyright disputes. But ever since it went back up, it has become one of the few publicly available trackers that works in most parts of the world without any problems. It’s got a user-friendly filter system that lets you see the Pokémon you prefer. For instance, you can set the tracker to reveal only those with an IV percentage of 85% and above, and you will only see Pokémon of that type within a given area. So, if you’re looking for something that can cover most areas, this one is worth looking at. PokeTrack – This one has been known to be an exceptional choice for those who are using Android phones and tablets. It can scan for all kinds of Pokémon in the background while showing you their names, moves, levels, IV percentages, and other important stats. Like other trackers, PokeTrack also allows users to sort the Pokémon according to rarity. More importantly, the app sends out a notification to let you know every time a Pokémon you’ve specified has popped out. You can even set the sound of the notification. One interesting fact about PokeTrack is that its developers somehow managed to get it integrated with Google maps, making it that much easier to navigate it while tracking Pokémon. 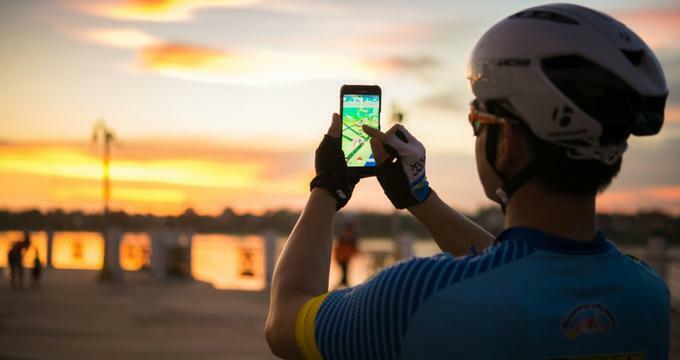 You can even use the app to locate nearby PokeStops and Gyms without having to painstakingly walk around to find them. It turns out that PokeTrack also lets you set lures for free, which is great for going on catching sprees. Also, if you’re playing with friends, you can share spawn locations with them using the app. PokiiMap – What makes PokiiMap stand out as a tracker for Pokémon Go is that it shows spawn points on the map, so you don’t have to walk around to find them. This scanner has so many features for android users that you’ll have everything you need to fill up your Pokedex in time. To use the app, you’ll have to login using your PTC or Google account. From there, you’ll be able to use the filters as you want and get notifications for them. Meanwhile, you’ll also be receiving information like the levels, powers, IVs, and other stats of the Pokémon that show up. Note: Between the Google and PTC accounts, the latter is more recommended. PokeSensor – This scanner, aside from being complete free, is fully customizable as well. You can freely adjust the distance of the scanner as well as the speed of the scan and take advantage of the enhanced adaptability, making the scans more reliable. Best of all, the entire interface is user-friendly and simple, so anyone can learn to use its controls and configurations. The tracker is designed to be used alongside the game itself, allowing you to find Pokémon and know their details as well. You’ll have to do most of these manually though, but the results are so accurate that they’re worth the effort setting up. The developers of this app also keep everything up to date so that they adapt to every update released by Niantic. PokeHunter – This one’s a global Pokémon scanner that allows you to run the app on any location you choose (and not just the areas near you). The scanner will run on a given radius and then give you the results. It’s so straightforward and simple to use, just input the location into the given box and press enter. You can then choose an area on the map the appears and click on the spot you want to scan. There are so many other scanners and trackers out there, but these ones will undoubtedly help you find all the Pokémon you’re looking for faster than you think. Enjoy catching them all!